Implementing Agile isn’t as simple as it sounds. It’s filled with pitfalls and challenges. We’ll guide you through a proper implementation using the AgileSparks Way starting from strategic exploration of needs and options, rolling out new frameworks and practices including training if needed, stabilization of the new approach through empiric inspection and adaptation. Throughout the journey we will be monitoring progress towards the outcomes you set out to achieve and teaching/mentoring your people so they can sustain the new way of working on their own as soon as possible. Applying Agile at scale can be difficult and confusing – unless you have an experienced guide. What we’ve found is that implementing agile at scale works best when you take an established proven approach such as SAFe and inspect and adapt it to your company, your domain, and your goal. Real Scrum is professional Scrum. It is based on Empiricism concepts – Transparency, Inspect and Adapt as well as Scrum Values – Focus, Openness, Commitment, Courage, and Respect. Real Scrum is hard. It requires challenging your comfort zone. Since 2009 we’ve been helping companies like HP, Comverse, Amdocs, NCR, AT&T, Eagle Investments, Philips, Motorola implement Scrum in a professional way. Our team of Professional Scrum.org Trainers (PSTs) and coaches has a deep understanding of Scrum theory, practices as well as real-world application that is pragmatic without sacrificing the heart of Scrum. Kanban is a flow-oriented method for working in a lean/agile way. AgileSparks coaches have tons of experience applying Kanban at the enterprise product development level in some of the world’s leading companies. If you’re looking to take an alternative path towards agility, we can help you build your Kanban flow system, help you limit and reduce your Work in Process, and inspect and adapt your workflow. We believe Scrum and Kanban are better together. Most of our clients are already combining Scrum with Kanban as a pragmatic way to get the best of the Iterative team-oriented empiricism of the Scrum framework and the Lean/Flow/end-to-end pragmatic perspective of Kanban. Our world-class Scrum+Kanban practice includes Yuval Yeret, steward of the Scrum.org Professional Scrum with Kanban class. We can help you enjoy the best of Scrum AND Kanban as well. DevOps is a combination of culture principles and tools that both aim to break the conflict between Dev and Ops silos by leveraging Lean and Agile thinking and practices at a wider scope than just the development and testing process. 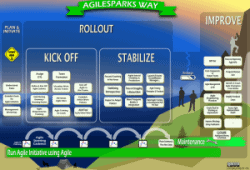 AgileSparks coaches can help you create a smoother and increasingly speedy flow of value from development into production (in some cases all the way towards Continuous Deployment/Delivery). We will help you figure out how to evolve or even transform your organization, your processes, metrics and your tools to support DevOps. Agile Marketing helps marketing organizations become faster, more flexible/responsive and more collaborative in order to be better tuned to the business they’re supporting. Our Agile Marketing practice has experience working with in-house marketing departments as well as agencies where we help marketers and marketing leaders transform their operating system to a more agile model. Lean Startup is an approach used by entrepreneurs and intrapreneurs to apply extreme agility in cases of high uncertainty around Product-Market-Fit. Whether you’re a Startup or a disruption-focused group in a larger company, we can help your product team figure out how to apply Lean Startup to help you define an aggressive Minimum Viable Product and work with the engineering team to dramatically accelerate your Build-Measure-Learn cycle. Our team accompanies you in your Agile journey from initial exposure training, through strategic implementation planning and steering, all the way to the trenches of helping teams and programs implement Agile frameworks and practices and inspect and adapt them until you achieve the business outcomes you’re aiming for. We’ll help you explore your context/pains, understand the Lean/Agile options and guide you towards a blueprint for implementation and change management that fits your context. Regardless of whether you’re just starting your Agile journey or trying to revitalize/boost, our small team of highly experienced Agile coaches will help you and your people deal with the many challenges of real agility.